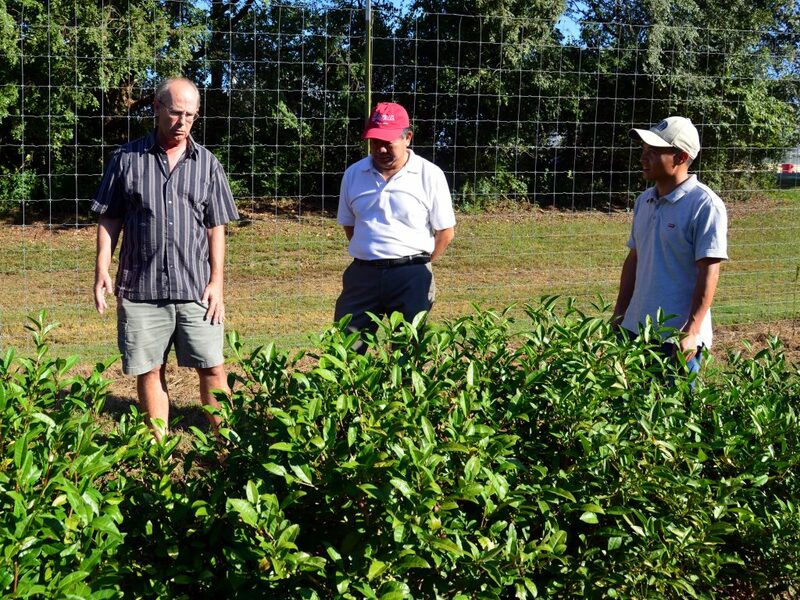 University of Georgia professors Jeff Bennetzen (left) and Donglin Zhang (middle) discuss tea at the UGA Horticulture Farm with Zhilong Hao (right), a visiting professor from Fujian Agricultural and Forestry University in China. Tea (Camellia sinensis) is a native plant to China with more than 3,000 years of cultivation. Like its cousins, sasanqua and Japanese camellias, tea has been grown in the continental United States for more than 150 years. But due to the costs of processing, cultivation and labor, it has never become a large-scale cash crop. With growing interest in craft teas and innovations in breeding and harvesting technologies, now is the time for Americans to start getting their cups of tea from locally sourced tea farms. Based on conversations with potential growers across the southeastern states, the demand for locally grown tea is high. Tea is one of the greatest horticultural crops, serving as both a beverage/food and beauty product ingredient. Currently, more than 4,000 tea cultivars had been documented for beverage tea production around the world. However, there are only about 140 cultivars of tea in the continental United States, and the majority of them are planted as ornamentals, except at the Charleston Tea Plantation in South Carolina. The wholesale value of tea in the United States grew from $1.84 billion in 1990 to $11.5 billion in 2015. Among these figures, 99 percent of the tea was imported.The most popular tea types are green, red, white, yellow, brick and oolong. Both tea cultivar and tea processing determine the tea type and quality. Some special tea types can be sold for thousands of dollars per pound. The southeastern region of the United States shares similar climate and soil conditions with tea production centers in southeastern Asia. Tea is a perennial crop that has about 100 years of productivity once established. Tea growers can harvest tea 15 to 20 times per year. Late frost damage will not significantly impact tea growers’ income. The University of Georgia (UGA) Woody Plant Research Laboratory started to collect tea plants as ornamental plants six years ago. 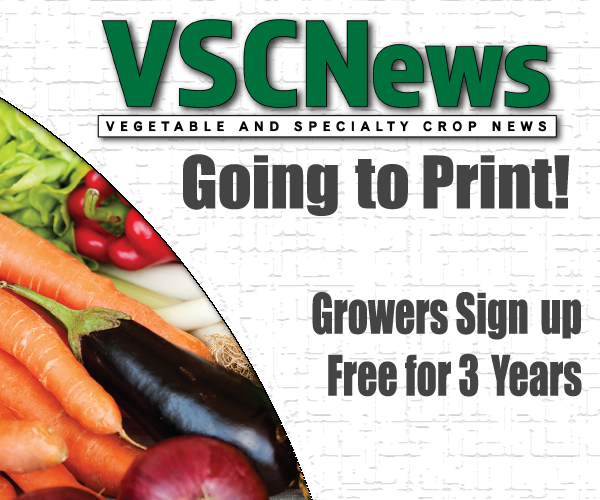 To date, more than 100 clones have been propagated and planted at the UGA Horticulture Farm for further breeding and evaluation. Surprisingly, tea is growing well in Georgia and other southeastern states. A tea plant that was brought back from Asia in 1870 and planted in Reidsville, Georgia, is still growing well. With support from the U.S. Department of Agriculture and the Agricultural Ministry of China in 2016, I, along with four other professors and growers, was able to explore the Chinese tea industry. Aspects of the industry we looked at included selection and breeding, propagation, establishment, harvesting, processing and marketing.The trip made me confident we can develop tea as a stable cash crop for specialty crop producers in the Southeast. Developing tea as a specialty cash crop can be accomplished by utilizing plant breeding efforts to select new tea cultivars that perform well in the Southeast. The initial UGA project is focused on selecting the best adapted tea seedlings for growers and determining the most critical knowledge gaps and barriers for tea farmers to successfully grow and market tea. From the UGA tea collection, researchers will select at least two elite cultivars for growers. The next step will be to provide tea reproduction (propagation), cultivation (both nursery and plantation) and management information to growers to increase their success in growing the crop. Tea harvesting and processing are also very critical for the success of tea farmers. UGA will test the existing tea processing techniques practiced in the United States (developed by the University of Hawaii) and in China. The tea components(nutrients and antioxidant compounds) will be analyzed with emphasis on the uniqueness of the selected tea cultivars. A goal is to improve the market share of tea as a specialty cash crop by providing outreach to interested growers. Research results on the best practices for growing and processing tea will be disseminated to current, beginning and prospective tea farmers and tea lovers. Tea topics to be addressed include plant regeneration, bed establishment, growing care, pruning, harvesting, processing and health benefits. Tea growers will have detailed guidance for establishing their own backyard tea production beds, which should lead to small-scale tea plantation farms for commercial production. In the near future, perhaps our iced tea will come from a local farmer sharing in part of the billion-dollar tea business. Donglin Zhang is a professor in the Department of Horticulture at the University of Georgia in Athens.